As you already know that considering 4 C’s of a diamond is important if you want to select a gem that is worthy of your money. Now, in this blog post you will read about different shapes of diamond. Selecting a perfect shape of a gem is equally important as it can make or break your personality. So, be ready to read here in detail about each of shapes and find one that fits your personality the best. Before proceeding, it is important to note that diamond cut never refers to the shape of a gem. Though, for giving a diamond its shape, it is necessary to cut it, the shape of a gem points towards overall geometry of a diamond. In contrast, diamond cut gives the gem its brilliance or fire and it essentially refers to a diamond’s facet and its proportions. So, there are ten basic shapes of a gemstone and these are – heart, oval, asscher, princess, marquise, emerald, cushion, pear, round, and radiant. In the following portions of this blog, you will read more about each of these geometries. Detailed description of such shapes will help you find the right diamond shape for your personality. So, let’s begin with round shape gems. Round Diamond – it’s the most versatile diamond shape that has been loved by everyone from centuries. It’s an everlasting shape that fits every personality. It looks elegant and modern in simple settings. At the same time, it looks extremely beautiful in elaborated styles. You will marvel that it is most popular choice for engagement rings and makes almost seventy five percent of total diamonds sold. Another interesting fact about round shape diamonds is that it has 58 facets that give round diamonds their unbelievable sparkle. Simply put, these facets cause light to bounce back from the bottom of the gem through the top and thus, give the gemstone most of its sparkle. Also known as Round Brilliant Cut – RBC or brilliant shape, round diamond shape can be ideal for your personality. Emerald Diamond – emerald cut diamond is often linked to glamour, beauty, and charm. So, this could be your perfect gemstone if you are all about beauty and glamour. But, how it looks like? Well, it’s a rectangular shaped gem with lean yet long facets that extend downwards. However, this diamond shape lacks in brilliance, it is one of the most popular shapes that shows off cool confidence and elegance. While looking at its flat part on the top, the gem shows off its excellent clarity that is better than any other shape. This cut shape is created in 1920s. However, emerald diamonds from that period boast of a rectangle shape with cut corners just like stair steps. Today, an emerald gem resembles a long, glamorous line at the top facet of rectangular shape. Cushion Diamond – typically, this shape belongs to those who have romantic bent of mind. So, if your personality type is dreamy, cushion gems is the shape for you. Also known as pillow cut, these diamonds are perfect for those who are extremely careful about meticulousness in their lives. These gems look like a huge rectangle whose corners are rounded. Since, cushions cannot be executed easily on smaller stones; these are bigger gemstones that will be a bit pricey. Then again, bigger size means that cushion gemstones will have larger facet that will increase their brilliance. Marquise Diamond – this cut shape refers to dramatic personality. There is an interesting story behind this cut shape. It is said that this cut was invented in 18th century, during the reign of Louis XIV and it is named for his queen – Madam Marquise. Ancient diamonds with this shape boast unique, pointed cut. These were oval in shape and had rounded sides with points at each end. Collectively, this cut shape diamonds looked pretty much dramatic and distinctive. Though, modern-day marquise diamonds have hexagonal surface. Top and bottom of this cut shape gems have facets to reflect light. Since this cut shape looks larger than its actual size, this cut shape gem can make your fingers look leaner and slender. So, if you give opulence an important place in your life, this is the perfect shape gem for you. A marquise cut shape is also ideal for those who are looking to increase the carat weight of their gemstone. Pear Diamond – pear cut shape gem means that a unique cut shape diamond. Its shape resembles a twinkling tear drop. 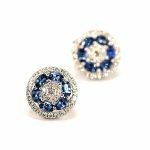 Diamond lovers pick this distinctive shape gemstone for earrings and pendants. Though, a pear shaped diamond also makes for a perfect choice for an engagement ring. However, its unbalanced, fatter or elongated facet is usually unfit for ornaments with fine designs. But as stated above, this unique shape is an ultimate choice for few unique personalities like you. Asscher Diamond – this cut shape is made for those who are vintage lovers. This cut shape resembles greatly with emerald cut shape diamonds except for its shape that is square this time rather than being rectangular in shape. This is why it is called square emerald cut diamond, oftentimes. This striking gem boasts of a thicker facet that has clipped corners. This means that this cut shape looks octagonal in shape. What’s more, its stepped sides make it different from another square cut shape diamond – the princess cut gems. This cut was invented by Asscher brothers of Amsterdam in 1902. It was one of the most popular cuts during 1930s. Today, it is equally important for vintage and antique lovers. Oval Diamond – oval cut shape gems refer to an innovative personality. Their brilliance is simply remarkable, just like a round cut shape gemstone. This cut shape is well known for its even and symmetrical facets. Hence, as a solitaire, this cut shape is identical for those with shorter fingers. This sort of cut shape diamond will also be a perfect match for people with smaller hands. The reason behind this fact is that an oval diamond’s elongated shape gives illusion of length to wearer’s hands. So, if your hands are shorter and you want to give your fingers a slender look and feel, go for an oval cut shape gemstone. And yes, if you want, you can also maximize an oval diamond’s beauty by including some side stones like emerald, sapphire, or any other gems. Heart Diamond – if you love to wear your heart on your fingers then you will instantly fall for this cut shape gem that is an ultimate symbol of sentimentality, love, and romance. Though, this is an uncommon shape for an engagement ring, few rare people choose this cut shape for their ring as a symbol of their love. However, while making a heart shaped diamond your heart, be careful for hidden flaws as this cut shape is one of the most typical shapes that are hard to execute perfectly. One more point to consider here is that this cut shape diamond typically has a fatter, elongated facet hence it can increase your diamond’s carat weight and size. Radiant Diamond – this cut shape gem is very rare and due to its scarcity, it is one of the most precious rocks for an engagement ring for any diamond lover. Radiant diamond refers to a diva – a woman who is very special. Talking about its characteristics, this cut shape gemstone is a perfect mix of elegant glamour of an emerald cut diamond and brilliance of a round shaped diamond. Thus, a radiant cut shape gem looks like sparkly square that has trimmed corners. Another rare and interesting fact about this cut shape gem is that its underside is cut in a way so that it reflects extra special sparkle. Behind the unique sparkle of a radiant cut shape gem is its 70 facets that also maximize its color refraction. Princess Diamond – it was 1961 when a jeweler from London had invented princess cut diamonds. It’s a square shaped gemstone that has an array of 49 to 144 facets that depend on the size of the rock. As the name refers, this cut shape gemstone is mostly loved by girly girls. This ladylike gem is the second most preferred rocks after the round cut shape gems for engagement rings. 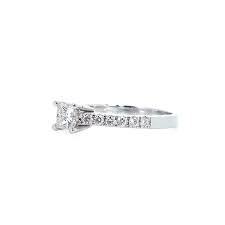 Also, a princess cut diamond ring is renowned for its excellent sparkle. Its flaws might be less noticeable due to its inherent sparkle hence you should be very careful while selecting this shape gem for your jewelry. Moreover, this is one of the least expensive shapes to be created in diamonds of all sizes. Above is a detailed explanation on each diamond shape. You can select one of them that define your true personality. However, diamond shape is least important fact to consider while selecting a perfect gem for your ornament after 4 C’s. But, if you consider the shape of a rock, you will increase your chances of finding a prefect stone that enhances your individuality. If you want more details on each diamond shape, don’t forget to consult an expert while you are selecting a perfect shape for you.